Today, people have all kinds of devices, which enable you to play videos with different file formats. Undoubtedly, iOS and Android devices are the mostly used devices all over the world, and they have different supported video file formats, so the videos in iOS devices can’t be played in Android devices. At this moment, you can convert your videos from MOV to AVI for playback, because MOV is mostly used on iOS devices, and AVI is a widely used video format. In this guide we will learn about how to convert MOV to AVI format with several helpful online and desktop video converters. KeepVid Video Converter is a desktop video converter program for Windows and Mac users. This software can help you to convert, edit and download videos with very helpful features. KeepVid Video Converter is regarded as the best converter program among all of the video converters. There are enough preset profiles available in the program which enables you to convert videos perfectly in the desired format. Convert videos with the helpful high-speed conversion feature. Convert videos for any device, such as Android device, iOS devices and so on. Step 1. Start KeepVid Video Converter and add the MOV file from your computer. Step 2. Select AVI as an output and click the Convert button to start converting MOV to AVI. Step 3. Find the converted video in Converted tab when the conversion finishes. Download and install KeepVid Video Converter in your computer, then start it. Now click the Add File or Add Folder button at the upper left corner of the main interface, and add the MOV file from your computer. Or you can drag and drop the file into the program window. 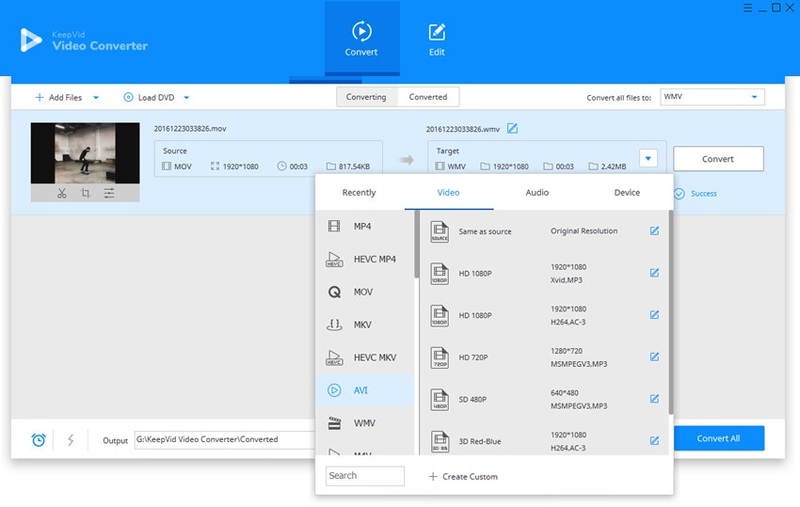 KeepVid Video Converter will display the detailed information of the video. Now you can click the inverted triangle icon at the right side of the Target area, and choose AVI as the output format. You can also click the inverted triangle icon at the right side of the Convert all files to button, and select AVI as output. Now Click the Convert or Convert All button to start converting MOV to AVI. The program will show you the process of conversion. When the conversion finishes, you can get the converted file in Converted tab, or you can right-click the converted file and choose Open File Location to locate the file in your computer. KeepVid also helps to convert AVI to MOV with easy methods. With the help of these methods, you can get the work done in these process. • When you are converting a video to another format, you should pay attention to the video quality. At times, the quality of the output file may be lower than the original file. • You can take advantage of the editing feature of the video converter to customize your video. • KeepVid Video Converter will keep the original video in your computer. The following part will introduce the top 3 online and desktop converters for you to convert MOV to AVI format. KeepVid Online Video Converter is an easy-to-use and convenient tool. If you don’t like to install any software on your computer to convert MOV to AVI format, you can take advantage of this online converter. This online converter program enables you to convert videos to more than 50 video and audio formats. It allows you to convert videos in a very convenient way so you just need to upload the files and choose output format, then click Convert button. Once everything is done this website will give you the download link in the converted format. 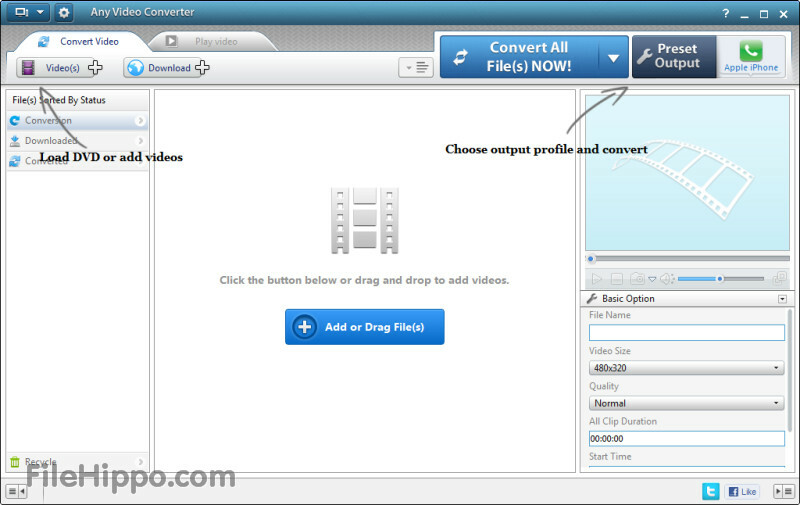 When it comes to converting MOV to AVI, Any Video Converter Free is also a good option available on the Internet. This program will not let you down. It supports both offline and online conversion which means if you like any video on the video sites, you can download and convert it using this software. It supports several popular formats but not much as compared to the KeepVid Video Converter. Free HD Video Converter Factory software it also a good choice to convert MOV to AVI quickly. This program is available for free but with very limited features and convert formats. You can easily start the conversion process. There are several editing options (Cut, Special effects and Crop) also provides in this program to give your videos the look you want.